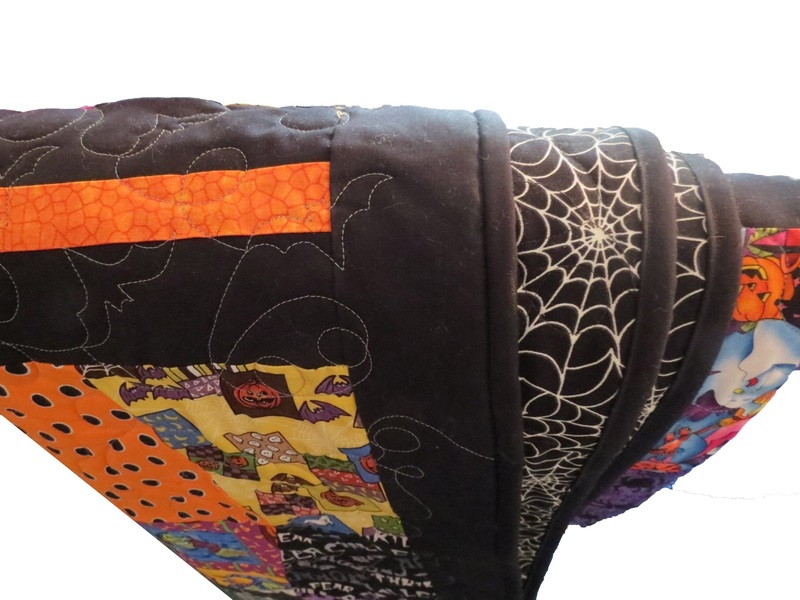 My 2014 Halloween Quilt binding is completed. OK, I'm 2 days late but I'm so happy it's done. Time to celebrate a finished quilt! I decided to try and complete the binding by machine. I used the Clover Wonder Clips on the quilt to wrap the binding to the back and hold until I would sew it. I would give the clips a B+ on a review. Here's some pro's and con's that I think of them. It takes a lot of them to hold the binding. I placed one about ever 2" So you'll probably need to buy multiple sets. If you open them with too much force, the spring mechanism breaks or stretches so they don't hold anymore. 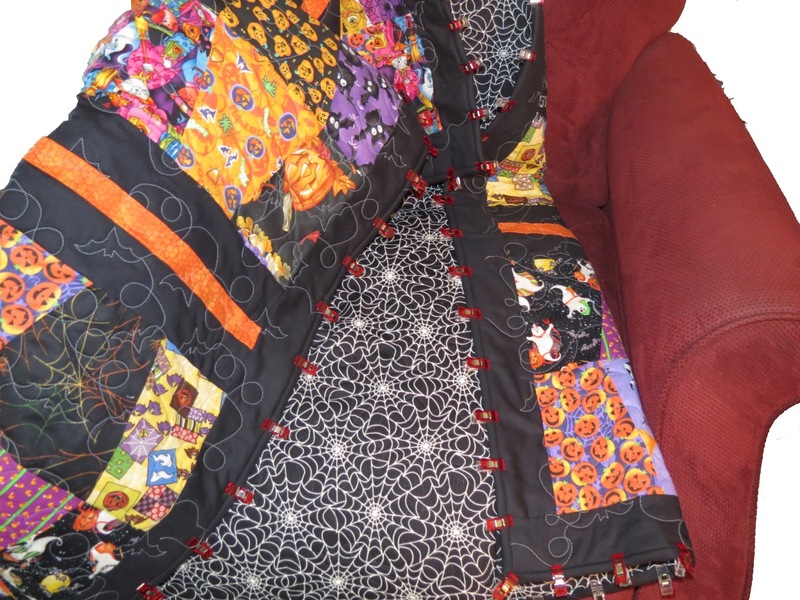 It's hard to move the quilt around with all those clips on it. They get caught on things. I still had to go back and resew a couple areas where the binding wasn't caught on the back. Good thing was that this was black binding on back backing.. you can't see the resew areas. Taking them off is a little slower than other type clips I've used. Amazon has them on sale for about $11 for 50 clips. They hold the binding a lot better in place than trying to sew on binding without them. Hey, 90% accuracy is great in my book when it comes to binding. Sewing went slow but it was a heck of a lot faster than hand sewing the binding to the back. It only took me maybe 20-25 minutes to finish a 60 x 80 quilt. I'll definitely use them again when I want to machine sew a binding on. and here's the finished binding. Now on to quilting the Christmas Present Quilt with a Christmas Present Panto I created.